Tempered glass lens with metal safety grill. All weather 3 foot, 18/3 SJTW cord with molded plug. Spare bulb included. Adjustable magnetic mounting bracket and motion sensor. Mode switch chooses between manual or motion sensor operation. Detaches from its bracket for hand-held use as a flashlight. 50 lumens, LEDs last 100,000 hours. Uses 3 AA batteries, (not included). Includes double-stick tape, screws and drywall anchors. 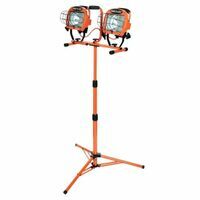 0.35 lb., 13"L x 1"D x 6"W.
LED work light with stand. Motion sensor night light, 30 lumen mini lantern and 60 lumen flashlight, 3 lights in one. It can sit on its base, be held or hung by an integrated handle. 60 lumen flashlight is built into the base. Off and on manually or with the motion sensor for automatic operation. Night light casts a pleasant glow. 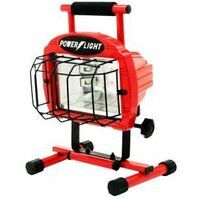 Portable as a lantern for power outages or emergencies. Rechargeable battery and USB cord to recharge the battery is included. LEDs last 100,000 hours. 11" length x 2" depth x 6" width. 0.45 lb. Floor stand. 40" tripod. 6', 16/3 SJW cord. UL listed.